Vojdan Pop Georgiev - Cernodrinski, was born in 1875 in village Selce, near Debar & Struga. 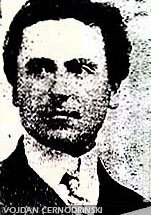 The beginnings of the Macedonian theatre and Macedonian drama literature are connected with the name and the work of Jordan Hadzi Konstantinov - Dzinot, but the Macedonian drama art from that period, is mostly connected with the name of Vojdan Pop Georgiev - Cernodrinski. Almost each of his screenplays treats the problem of the life and struggle of the Macedonian nation for freedom. Vojdan Chernodrinski encouraged the spirit of the Macedonians and suggested the idea that the time for showdown with the captor had come. That's how he supported the activities and actions undertaken for preparation of a future uprising in Macedonia, making the foreign observers to sympathize with the Macedonian nation. 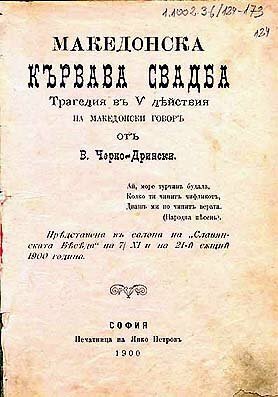 Vojdan Cernodrinski wrote several plays: Zlo za Zlo (Evil for Evil), Majostir (The Cratfsmen), Od glaata si patime (From our head we suffer), Duhot na slobodata (The spirit of the freedom), Srekja (Fortune). Nevertheless, his most famous play is the tragedy "Makedonska Krvava Svadba" (Macedonian Bloody Wedding".